The best and easiest way to install Ecosia in your Browser is to install our extension. 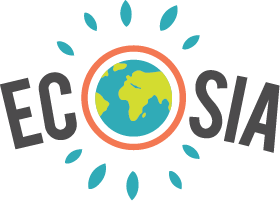 To install our extension either go to www.ecosia.org and click "Add Ecosia" in to top right or use the direct links to our extensions. We offer an extension for Chrome, Firefox and Safari. If you prefer to not install our extension or use another browser, OpenSearch is a very good alternative. OpenSearch is an open standard which allows you to add Ecosia as your default search engine. OpenSearch is supported by Chrome, Firefox, Safari, Edge, Internet Explorer, Yandex, Vivaldi and more browsers. The exact steps and names of the buttons might be a little bit different from browser to browser. Also make sure you have no other extension installed that sets or overrides your search engine settings. Note: You might have to replace "%s" in the above with another value based on your browser. I'm not getting the option to make it the default. Hi Sara, I had this problem too but found a fix. Then press enter. You should see Ecosia pop up as an option in the "Other search engines" field. Hover over it and then click "Make default". How do I make it the default on my phone? And also, can I have more than one searches open at the same time on Ecosia like on other browsers?